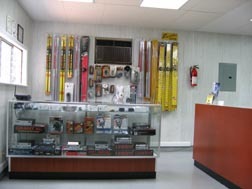 We have been in business full time since 1998 offering sales and service for both new and vintage radios. 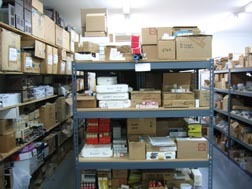 We have improve our ability at servicing many brands of radios by tripling out facilities to 1800 square feet, purchased the remaining parts and service department inventory of Browning Labs Inc of Laconia NH, and by having many new service parts custom manufactured and in stock for our customers. 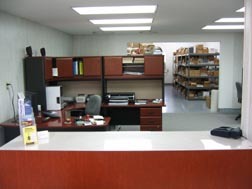 Our increasing inventory allows us to finish repairs in a timely manner giving our customer the best possible service. 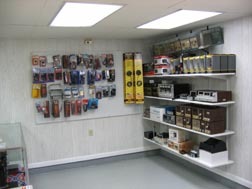 Remember to choose original Golden Eagle parts when repairing your Browning radios. Our trademark Golden Eagle is registered with the United States Patent and Trademark office in Alexandria, Virginia. So always ask for the best! 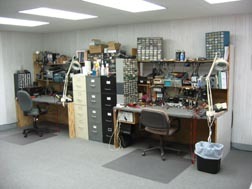 Our service benches are well equip with both regular and hot air rework stations, equipment from Tektronix, HP, B&K, Flute, Sencore, even some custom equipment made and use by Browning Labs. 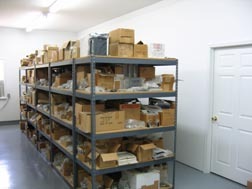 These two pictures are of half of our parts storage area, this pictured side is about 90 % Browning parts with the other side containing more storage, work area and larger pieces of equipment.